Paul Vernon in Frostbite League action. Nene Valley Harriers and Werrington Joggers predictably led the local team challenge in Sunday’s Frostbite League race organised by Bushfield Joggers at Ferry Meadows. Werrington finished third behind Riverside Runners and Hunts AC with Nene Valley fourth. 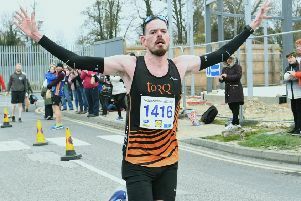 Peterborough Triathlon Club (PACTRAC) star Paul Vernon rarely gets beaten in a Frostbite event these days and he won the five-mile race in 27:00. It was his third Bushfield Frostbite win on the trot and his winning margin of 30 seconds was the biggest since he won the final race of the 2014-2015 season by 57 seconds. He won all six races in that 2014-15 season. Runner-up was James Mogridge of Yaxley Runners with Brian Corleys finishing third in the colours of host club Bushfield Joggers. The top 10 was dominated by locals with James Whitehead and Paul Halford of Werrington Joggers finishing fifth and sixth respectively , while Rob Brownlee and Micheal Channing of Nene Valley Harriers crossed the line seventh and eighth. Bushfield’s Phil Martin was close behind in 10th spot. Lisa Marriott of Ramsey Road Runners was the first lady home in 32:47 with Yaxley’s Gina Crane the next local home in fifth place. Louise Blake made the top 10 for Nene Valley in her second race of the weekend, as did Jade Watson of Werrington. After two rounds Nene Valley and Werrington are both placed near the top of the leaderboard, and will be confident of improving their positions as the season progresses. The Junior 2k race was won by the long-striding Eye Community Runners youngster Isaac Ellard in 6:09. Matthew Dowling from Nene Valley was runner-up. Hunts AC’s Shannon Flockhart was the first girl over the line with Flo Brill second in PACTRAC colours, a day after starring for Nene Valley in the national relays.